Villa in der Region Cinque Terre gelegen, umgeben von Olivenbäumen und der eleganten Villa ‚elegant eingerichtet und mühsam. Die Villa liegt auf einem Bergrücken und ‚sehr sonnig genießt schöne offene Aussicht auf allen Seiten. Das Gebiet ist ‚sehr ruhig und‘ in einem sehr eleganten Ambiente eingefügt. Tolle Lage für diejenigen, die Toskana und die Cinque Terre zu besuchen. Die Gäste werden bei ihrer Verwendung durch den Garten haben, Schwimmbad, einen Pavillon mit Sofas, einem Pavillon mit Essbereich und einen privaten Parkplatz. Die Gäste haben Kontakt mit dem Eigentümer bei der Ankunft. eine Person für alle Informationen immer zur Verfügung steht. Auf Wunsch Massagen Yoga Abendessen Aperitif Bootsfahrten. C -1 Schlafzimmer mit Doppelbett, ein geräumigen Wohnzimmer mit Schlafsofa für 2 Personen und ein Badezimmer. Das Haus ist komplett ausgestattet mit allem, was wir im Gegenzug Respekt fragen! Wasser-Licht hat Bettwäsche Handtücher separat gezählt werden sollen. bei der Ankunft müssen Sie eine Anzahlung vereinbart werden (in der Regel 400 €) gezahlt werden, die bei der Abreise zurückerstattet wird. Vi firade min födelsedag tillsammans med familjen. Bostaden motsvarade absolut våra förväntningar. Läget var bra. Trädgården jättefin. Alla var mycket nöjda. Vår värdinna Stephania var väldigt hjälpsam o gav oss många bra tips. Vi hade verkligen en underbar semester i Italien! Our hosts were incredibly kind and helpful. They took excellent care of us and answered all of our questions. We spent a rest day there and it was very relaxing. We booked one of the meals from the menu they offer for our first night there. It was better than any restaurant and sitting outside enjoying our meal was wonderful. All in all a great place to stay. Thank you Stefania and Pietro for taking such excellent care of us. you are fantastic guests. it was a pleasure to meet you and I hope you will come back soon ! Superbe et grande villa , très confortable et parfaitement équipée , parfaite localisation pour visiter les Cinque Terre et alentours . I hope I can host you again. Villa Altar is in the peaceful hills bordering Tuscany and Liguria, and only twenty minutes drive from the big port of La Spezia, the gateway to the Cinque Terre. 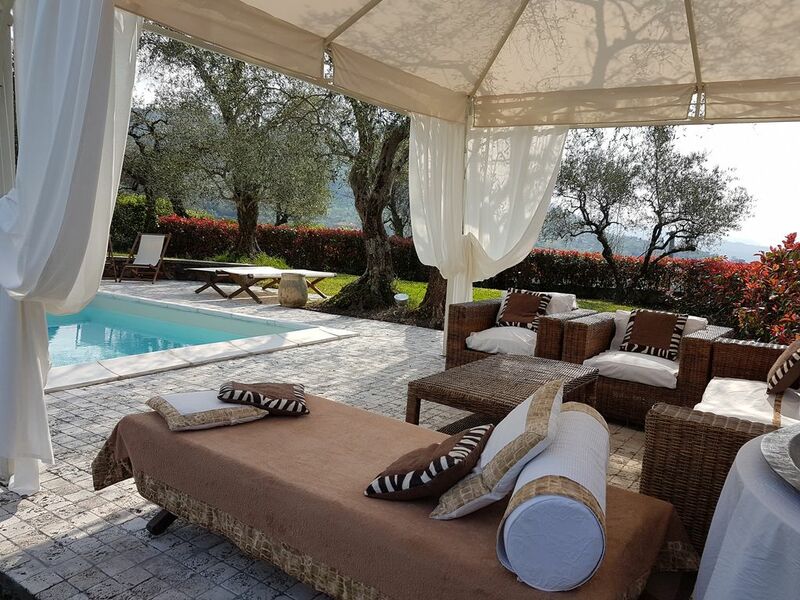 The villa itself is like something from a luxury photo shoot - lovely pool, surrounded by olive trees, with a gazebo for evening drinks and relaxing. On one side is the coast and on the other, the most beautiful rolling hills and sunsets. Inside the house, everything is clean and cool. And there's a wonderful outside eating area with BBQ and lighting. Stefania, the host, is utterly charming and helpful, and will tell you all you need to know about the area. Note: if you're not from Italy, the recycling takes getting used to. It's much more thorough than in the UK, which is a good thing, but read the instructions carefully or you'll be left with bags of stuff you don't know what to do with. Enjoy a wonderful stay. The pretty Cinque Terre with it's bright villages teetering on the rocky coast is on the doorstep, and it's ridiculously, brilliantly easy to get to by train. Swim off the harbour at Manarola - snorkel with the bright blue anchovies, and jump off the tall rock if you dare! I would say that PortoVenere is my favourite town, which isn't exactly in the Cinque Terre but close, and more 'everyday' with interesting streets and shops and fewer tourists. Lucca and Pisa are just an hour away, and Florence 1.5hrs. There is a lot to see, and if you like hiking or swimming, this is the place for you. Best things is, after a hard day's sightseeing, coming back to Villa Altar and watching the sunset with a glass of something delicious, listening to the cicadas until nightfall. Villa meravigliosa, collocata in un contesto geografico interessante (5 Terre, Portovenere, Lerici, La Spezia). Padrona di casa impeccabile, sia nell'ospitalità, che nei suggerimenti dati sul mio soggiorno. Fondamentale la pulizia della casa, arredamento della villa con un gusto elegante, e soprattutto un giardino meraviglioso, con una splendida piscina incastonata. La consiglio a tutti, sia per un soggiorno a due, come per un soggiorno con piu' persone. Da visitare assolutamente : 5 Terre, Lerici, Portovenere e la città di La Spezia. Villa raggiungibile facilmente dall'uscita dell'autostrada...che dire...ci tornero' !